Keisha Elissa Garnett may have been in the water for about 15 minutes, officials said. A woman visiting from Dallas died early Tuesday morning, shortly after being rescued from the Chicago River. Divers pulled Keisha Elissa Garnett, 30, from the icy water near the Michigan Avenue Bridge at around 4 a.m.
Hailey Barham, who is visiting from Indianapolis, said she was driving when she saw a "hysterical" woman on Michigan Avenue near the East Upper Wacker Drive intersection, begging a cab driver to call police. "The cab driver didn’t call police. He just drove off," she said, later identifying the woman on the street as a friend of the person in the water. "I’m the one that called 911." Police initially said a witness reported seeing Garnett jump into the water. Officials later said she was with another woman and a man, all visiting from Houston, and likely fell into the water. Barham, 28, said the trio was staying at the Omni Hotel, at 676 N. Michigan Ave.
"I was in the squad car talking to police with her friend," she said. "[Her friend] was really shaken up. She was scared." After being pulled from the water, Garnett, whose name was not released until about 1:30 p.m., was transported in critical condition to Northwestern Memorial Hospital. 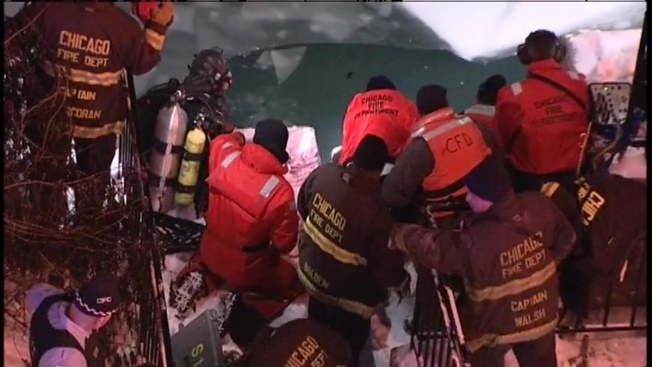 Two boats, one from the Chicago Police Department's Marine Unit and another from the Chicago Fire Department, moved through the blocks of ice during the rescue. Garnett may have been in the water for about 15 minutes, officials said. Correction: A previous version of this report incorrectly identified the victim as Alicia Garnett.